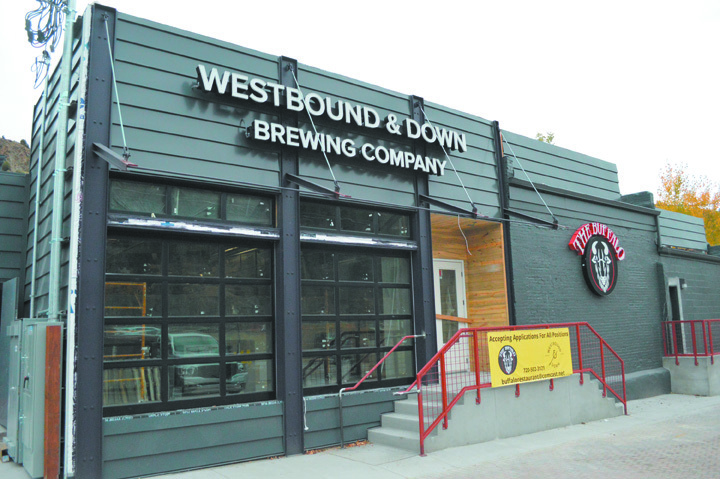 Preserving Colorado’s pioneering spirit while showing off sophisticated modern Industrial splendor in the olden Route 70 mill town of Idaho Springs, WESTBOUND & DOWN BREWING COMPANY came to fruition during December ’15. Becoming Idaho Spring’s second brewpub more than a decade after Tommyknocker hit the scene just down the road, Westbound & Down serve a creative menu of rangy brews (leaning on the IPA side) to go alongside a fabulous pub menu by historic cohabitants, Buffalo Restaurant & Bar. After passing by the famous wolf man, a locally popular canine rescuer with a leashed wolf, my wife and I enter the pub and grab the Mac & Cheese as well as a tzatziki-sauced falafel sandwich (with sun-dried tomato, roasted peppers and chickpeas). Connecting the rustic pre-prohibition Old West era to nuevo-designed architecture, Westbound’s prominent left side features a sprawling buffalo stomp wall design, lively buffalo mural and trio of buffalo heads, retaining the entrepreneurial frontier tenor of the Centennial State (see below). 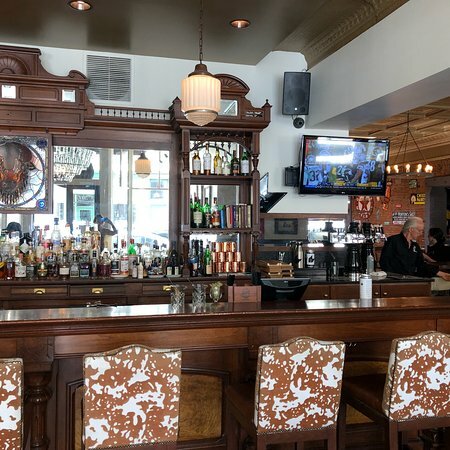 An exquisite 1860-built, L-shaped wood bar with 18 tap handles centers a few community tables and a huge couch (with a rear 15-barrel brew system). An antique bronzed tin ceiling also captures the essence of yesteryear. Meanwhile, the mod-decked opposing space contains a square peg-wooded central bar (with exposed pipes and wood-paneled floor) serving several contemporary aluminum-wood tables. Multiple TV’s take up all corners of the cozily pristine expanse. On a cool March ’19 Friday afternoon, general manager Josh Young plays host as I quaff eight samplers and purchase another six homemade brews for outside consumption. Demure eggshell-headed moderation, Don’t Hassle The Hefe, let stylish banana-clove-bubblegum sweetness receive a tart lemon-soured spritz and dry plantain reminder. Serene smoked helles lager, Kleine Keller Rauch Party, gently placed applewood-seared peat moss next to crisp pilsner graininess, leaving Band-aid-like astringency at the citric-snipped ‘green malt’ finish. Dryly Belgian-styled table beer, Soberish Monk, allowed lemon-rotted orange desiccation to prosper alongside tart orange meringue piquancy, peppery herbs, floral flourishes and mild wood-toned Amarillo hop bittering. Another stylistically sinister Belgian-designed elixir, Vers l’Ouest Tripel, coalesced candi-sugared lemon meringue tartness with black-peppered herbage and tingly pale malt spicing in a soft-toned manner. On the sour side, bold Hiver Noir Dark Burgundy Sour sought to elevate its oaken Flanders Brown lactic vinegaring with green grape-derived Sauvignon Blanc barrel aging, picking up dry burgundy, oaken cherry and leathery barnyard nuances. Softer thirsts should seek out mild sour ale alternative, The Curse of Lono Saison, a rustic farmhouse ale given vinous white grape tannins and salty lemon-limed bittering to contrast its sidled red wine sweetness. Dry Seven Sisters Stout evoked espresso, dark chocolate and black cocoa bitterness contrasted by barley-sweet Maris Otter malts. Heavenly Absence Bourbon Barrel Imperial Stout brought sweet bourbon licks to syrupy dark chocolate malting and cinnamon-spiced coconut respite. Conformist Czech-styled lightweight, Den’var Pilsner, maintained brisk corn-husked dryness, peaty wet-grained musk, musty citric-spiced perfuming and herbal Saaz hop rusticity above biscuity pilsner malts. Pleasantly centrist Colorado Pale Ale placed easygoing orange-peeled grapefruit rind bittering alongside grassy hop astringency and sweet pale malts. Easygoing candi-sugared citrus zest serenaded Trappist yeast-derived Belgian Pale Ale, where fig-dried lemon meringue tartness and bittersweet orange peel tanginess reached spicy pale malts. Spruce-tipped tropical fruiting engaged Hop Blender, providing sunny zestfulness for dank piney hop oiling and earthen grain musk. Bursting with tangerine goodness, approachable moderation The Other IPA picked up lemony grapefruit zest wrangled by aspirin-like hop astringency above bready pale malts. Dry-wooded grapefruit rind bittering bum-rushed Double IPA, leaving tangerine, papaya, mango and pineapple tropicalia upon lightly pungent hops and biscuity malts.